Obama Laughs at Debate Performance, Defends Libya Response on "Daily Show"
“Part of the president’s job is not only moving forward on things that will work, but also preventing things that won’t work,” Obama said. President Barack Obama made his second appearance on "The Daily Show," where he discussed his first debate performance and his administration's response to the Benghazi attack. 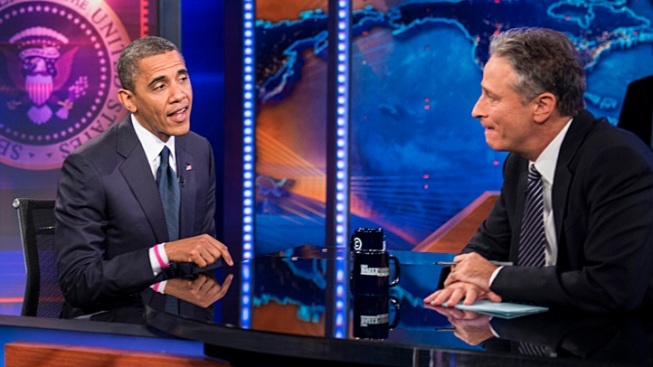 Fresh off his strong debate performance at Hofstra University, President Barack Obama dropped by “The Daily Show” Thursday, where he defended his response in the aftermath of the Benghazi consulate attack, and conceded an "off night" at his first debate. Stewart, by way of asking the president to explain his first debate performance, offered a possible explanation from personal experience. Although Obama acknowledged that he was “having an off night,” he emphasized that the issues he presented at both debates were the same: to ensure that the country doesn’t revert back to the policies that landed them in the economic recession. During the 15-minute interview, Stewart also pressed Obama about his administration’s muddled response to the Benghazi terrorist attack last month. Romney has challenged the Obama administration over initial accounts by officials that the Sept. 11 attack sprung from a protest about an American-made anti-Islamic film and were not a terrorist assault. “I would say, even you would admit, it was not the optimal response, at least to the American people as far as us all being on the same page,” Stewart said. President Obama, agreeing that the response to the attack was “not optimal,” maintained that his administration kept Americans informed. The president also shot down Stewart's claims that his administration was “confused” in the aftermath of the attack.